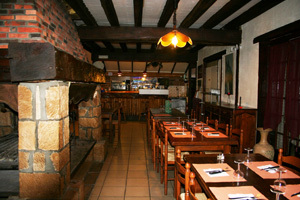 It was a Tuesday evening and our good friends Stephen and Sally had invited Trevor and I out to eat at a restaurant, they had suggested Le Stelvio, and Trevor had unbelievably actually agreed to eat there, even though we had eaten there not long before. 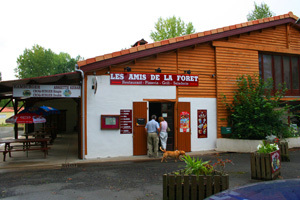 As fate would have it the restaurant was closed for two weeks annual holidays, so we had to seek an alternative, and we settled on Les Amis de la Forêt on the outskirts of Mervent. 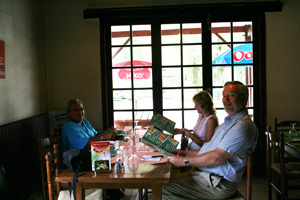 The restaurant is in a large wooden building on a campsite and even though it was August the proprietor had to unlock the restaurant door to let us in when we arrived. 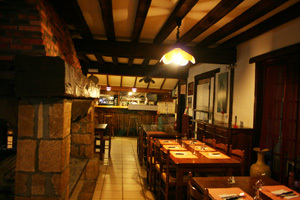 The bar/dining room was a large open room with a bar at the far end and a huge grill in the centre surrounded by tables. There was a covered terrace outside with picnic tables, fortunately we decided to eat inside as it was unseasonably cool for August and it proved to be a very good decision as midway through our meal there was a downpour of such proportions that Trevor started drawing plans for an Ark on his serviette. 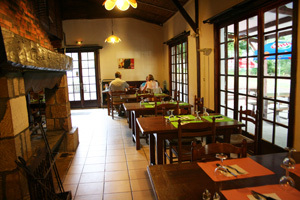 I was staggered that we were the only diners, I can understand restaurants not being full in rural France in August especially at night, but this was after all situated on a campsite, it just shows how few people there are around. We settled down and had a round of drinks while we perused the menu, which consisted of Pizzas ranging in price from €7 to €11, on the grill was ham, a couple of different steaks and a kebab in a similar price range, three different types of moules, a couple of pasta dishes, 3 different omelettes and 5 different salads. 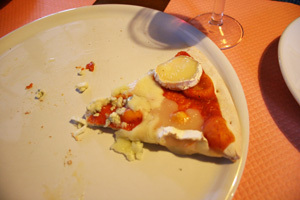 We decided that we would share a pizza as a starter and the proprietor suggested a three cheese pizza which had mozzarella, Roquefort and goat’s cheese and we decided why not. 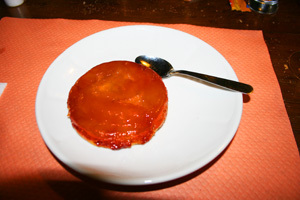 The speed with which it arrived precluded it from being fresh, whether it was a pre made base with the ingredients added or whether it came directly from the freezer, who knows, it was pretty tasty and the base didn’t crack any teeth, although it was a bit cold which may or may not be an indication as to its origin. Stephen and I were drinking the 50cl pitcher of red house wine which was perfectly acceptable so acceptable that we managed to order a second, and Sally was drinking rose. 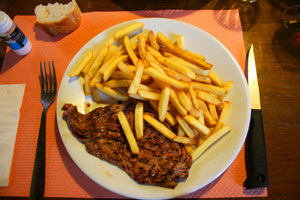 For our main courses we tried to order three entrecote steaks but alas he didn’t have any so we ordered the Bavette instead. Trevor and I ordered it rare and Stephen ordered his medium, I don’t think that his was well enough cooked for him, in fact unless you really press them most French restaurants cook all of their steaks rare. The steaks were good enough, they were cooked to my liking they tasted good and weren’t chewy or gristly. They were served with frites (which as usual were frozen) Stephen wasn’t too keen on them but to be honest frozen chips are frozen chips, telling the difference between them would take a palette far more discerning than mine and at least there were plenty of them. 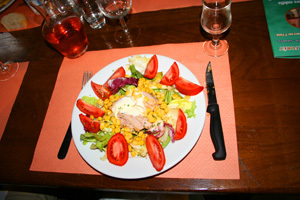 Sally had a Salad Fraicheur which consisted of a green salad with tomatoes, sweet corn, tuna and ham. Sally’s comments were that the salad was fresh and crisp with a tangy dressing, this was accompanied by a generous helping of tinned tuna. It was an enjoyable and satisfying main dish and for those with a larger appetite there is always the option of a side order of chips.